Original Sunburst Gibson Les Paul Standards, otherwise known as ’Bursts, came into production for only a few short years between 1958 and 1960 and represent a benchmark of guitar evolution. Bolstered by the earlier success of Leo Fender’s Esquire/Broadcaster/No-Caster/Telecaster solidbody electric guitars, the previous lineage of ‘Model’ Les Pauls were often referred to as ‘Goldtops’ and underwent a process of evolution and enhancement throughout the 1950s since their introduction in 1952. In ’54, the shallow neck pitch was deepened, the tune-o-matic bridge and stop tailpiece arrived in ’55, PAF humbuckers were introduced in ’57, and by 1958, the guitar was renamed as the Les Paul Standard and given a fresh makeover in the form of a colourful Cherry Red Sunburst. Due to their relatively low demand, very few ’Bursts were completed, with less than 600 guitars on average per year being shipped from the Kalamazoo factory. This defines the boundaries with regards to rarity, although their ultimate desirability was really down to a minority of forward-thinking guitar heroes who remained steadfast in the old ’Burst camp during the 1960s. 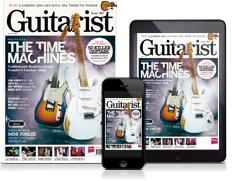 From those early players in the know who went against the grain – guitar legends such as Peter Green, Eric Clapton and Keith Richards – began a trickle that soon led to a surge in demand. And so, by the late 60s, Gibson reintroduced the original single-cutaway body. Nothing, however, has since quite lived up to the virtues of the original ’Burst in the minds of many players and collectors. Certain methods of construction and materials that were originally employed are virtually irreplaceable, and of the guitars that remain, many are fetching perhaps the highest prices of any standard production electric guitar model. The ’59 ’Burst pictured in this article was acquired by an anonymous owner for the sum of £279,000 from Hanks of Denmark Street, London with the assistance of ’Burst expert, Phil Harris. Phil provided an independent consultation as the guitar arrived at Heathrow Airport from Sweden, where it had been under the care of a recording studio owner for the past 10 years or so, as Phil explains: “[The new owner] asked Hanks if I would go with him to view the guitar and appraise it in terms of originality and also to play it. Having owned and played several ’Bursts since the age of 19, Phil, now 61, was with Gary Moore on the night he acquired Peter Green’s famous Les Paul Standard and has handled many more well-renowned ’Bursts over the years working as a consultant on the subject for Christie’s auction house. So did this ’59 live up to its reputation? The price of ’Bursts, aside from originality, will often be dictated not only by wear, but also by their inherent aesthetics. Generally speaking, the less faded and the more flamey the tops appear, the higher the price. Given the price of ’Bursts these days, one might ask what inspires a person to part with such a princely sum? Our anonymous owner is in no doubt about why he fell for this ’59: “It’s the Stradivarius of electric guitars and I thought, ‘One day, if only, I would love to own that piece of history!’ It has become such a famous instrument. You can see the nickel-plated tune-o-matic adjustable bridge and stop and pickup covers here. The cream ‘M-69’ PAF pickup surrounds are worth thousands alone on the vintage spares market! The exceptional tone of ’Bursts has a great deal to do with their double PAF humbucking pickups and the humbuckers in this ’59 are perhaps the most desirable of their type. On closer inspection we noticed that the neck had been refretted – a fairly common practice considering the age of the guitar and something that is often essential in order to be able to improve the instrument’s playability. “The way it plays is amazing – it’s a great straight guitar that should be played and the refret makes it play brilliantly,” concurs Phil. “It’s quite an early serial number for a ’59, and an early ’59 would have had the small frets, so I would bet that that’s why it was refretted. Although many collectors will rarely venture into playing such guitars with abandon, you may (or may not!) be pleased to know that this isn’t the case with this ’59 whatsoever. All ’Bursts tell a story. This one has been around the world from the USA, to Japan, to Sweden and now the UK – who knows where it may end up next?